The Danish island of Amager, located just east of Copenhagen, is the testing ground for an innovative stormwater treatment technology called dual porosity filtration (DPF). Early results from a demonstration DPF facility recently constructed on the island’s water-conscious Ørestad district have proven the technology’s ability to treat up to 110 L (30 gal) of urban, street-level runoff per second, say its creators. This volume is equal to 9.5 million L/d (2.5 mgd), or enough water to fill four Olympic swimming pools. The facility was established and is operated by Greater Copenhagen Utility (HOFOR) and the Copenhagen City and Port Development Corporation (CPH). DPF filters contain two thin, horizontal layers stacked one above the other. As runoff from Ørestad streets flows from collection systems into the underground DPF demonstration facility solely via gravity, it brings along dust, rubber, asphalt, heavy metals, and other contaminants. The runoff travels freely along the top layer, made up of a highly porous nylon netting. 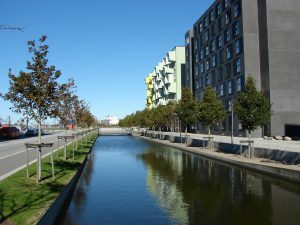 On the island of Amager, just east of Copenhagen, Denmark, the developing Ørestad district emphasizes sustainable and responsible stormwater management. At a new demonstration facility managed by Greater Copenhagen Utility and the Copenhagen City and Port Development Corp., a novel stormwater management process called dual porosity filtration has proven capable of treating up to 110 L/s (30 gal/s) of polluted stormwater. Orf3us/Wikimedia Commons. While moving along the top layer, gravity forces suspended solids in the runoff downward into the bottom layer, which features a limestone filtering mat. The limestone’s low hydraulic conductivity attracts the organic micropollutants in runoff that gravity is unable to capture on its own, such as dissolved phosphate, lead, and copper. The filter itself consists of about 30 sets of these layers arranged in a small box with ingoing and outgoing tubes. By simply aligning more boxes next to each other to build a chain, stormwater managers can scale up the DPF system to cover larger areas. Its flexibility also brings the potential for an eventual household-scale device, according to a UC press release. Testing at the demonstration facility showed that the DPF method consistently reduced runoff contaminant loads from more than 100 mg/L to less than 5 mg/L. In addition to requiring no chemicals or power, the DPF process is also odorless and nearly silent. And because the limestone mat accumulates contaminant particles only on the lower layer of the filter, clogging is not an issue and the mats require replacement or regeneration only about once per year. Ørestad is one of many “innovation districts” – projects to redevelop and rejuvenate decrepit or underused urban neighborhoods using state-of-the-art approaches to city planning – in development around the world. The district’s opportunity to try new tactics to enhance environmental sustainability along with its coastal location made Ørestad an excellent setting for DPF trials, says CPH CEO Anne Skovbro. According to the Danish Ministry of Environment, rainstorms in Denmark have intensified by around 20% both in terms of frequency and intensity over the last 25 years. “Engineers and developers from around the world are being challenged to make climate renovations in cities in preparation for the type of increased rainfall that we have experienced in recent years. Since the beginning of our development in Ørestad, we have succeeded in locally managing rainwater that falls onto ‘clean’ surfaces like rooftops or bicycle paths. Now, the dirty runoff from Ørestad can be cleaned locally. It is a major gain for climate preparedness,” Skovbro said. Another of Ørestad’s environmental features includes more than 10 km (6 mi) of canals that interweave the district, which are fed directly from rooftops. Bergen Jensen says with a better understanding of water quality risks, stormwater from streets that undergoes the DPF process may be able to provide additional flow for the canals. Until then, operators at the DPF demonstration facility are releasing effluent into Amager Nature Park, a massive, protected wetland area that covers more than 1/3 of the island. Once limestone rock pores become filled with heavy metals, how are they replaced? When you do the yearly flushing what happens to all the pollutants that have accumulated? Do you need to dispose of them separately?